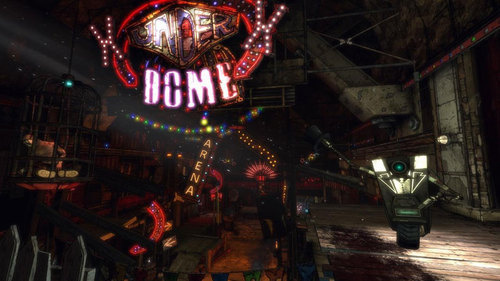 Mad Moxxi wants to welcome you to the under dome. She's not going to make your stay easy though, instead she's going to throw Moxxie's Maxims - not the magazine - at you to keep you on your toes. Hot Potato, Dodgeball, Bodyshots, Ironhide and more look to make your arena battles more difficult...and hopefully more fun. All of that sweet sweet loot that you pick up? Well you can stash it for later in your stache' bank. Perfect for trading with your co-op pals. The Borderlands DLC that's much like Halo 3: ODST's FireFight mode is out today for the Xbox 360 and will cost you 800 . You can download it right here. Don't think this DLC is for you? Watch the exclusive trailer from Joystiq and see if that changes your mind.